As fall is in the air here in Michigan, I can’t help but realize how close we really are to turning the corner into the holiday season. If your life is anything like mine there are extra demands placed on your time, placed on your budget, and placed on your patience. For this reason, now is an excellent time to focus on minimizing the holiday stress you will feel this year. As busy women and moms it can be next to impossible to have a fun Christmas if all the planning and organizing isn’t under control. So, let’s fix that. 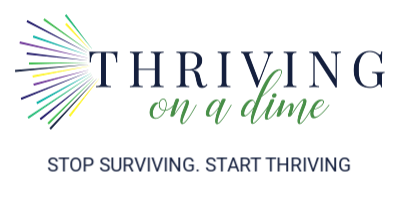 Looking for more joy and less stress this holiday season? Enter your email below to have our holiday planning guide sent right to your inbox! For moms, the focus is so often on making sure our kids have fun at Christmas that we don’t have time to worry about whether or not we have any fun. But, we really don’t have to choose between our kids having fun and us as moms having fun. Christmas is a fantastic time to have fun as a family. The best thing we can do is to take care of making things a bit easier. We can focus on planning what we can. And, we can even take some shortcuts, cross things off our list that simply don’t have to be done, and even delegate things to others who can help. It may feel like you have little to no control of those crazy busy holiday months, but there really are several things you can do. And, most of these are nothing more than a simple mind shift. 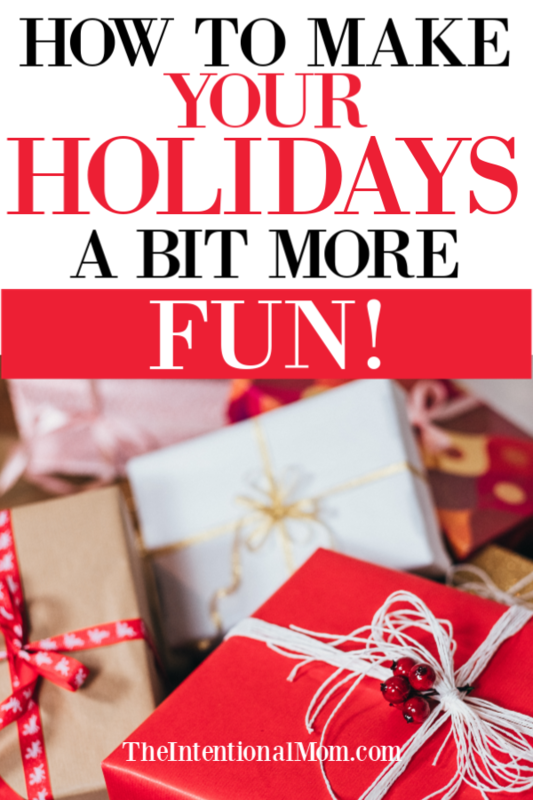 So, if you’re looking for some Christmas fun as a family, let’s talk about what we can do now so there’s less holiday stress! What is it that is stressing you most right now? Is it all the places you have to go? Maybe it’s the gifts you have to buy? Is it the meals you have to make? Or maybe it’s the fact that you still have to feed your family meals while you’re having to juggle all these extra things. In this step, identify the top three things that stress you most about the holidays year after year. You know what this is. It’s all those things that you think you have to do and all the things that you think you need to do because someone else is doing them. It’s time to debunk at least some of them. This could be things like all the teacher gifts, all the holiday ornament gift exchanges, and making Christmas cookies for all the neighbors. It could be the Christmas pictures of the family in their coordinating outfits, the matching Christmas pajamas, and the perfectly adorned front porch. What about thinking about buying the perfect gift for everyone on your list? Does this stress you out? And really, the list only goes on from here. 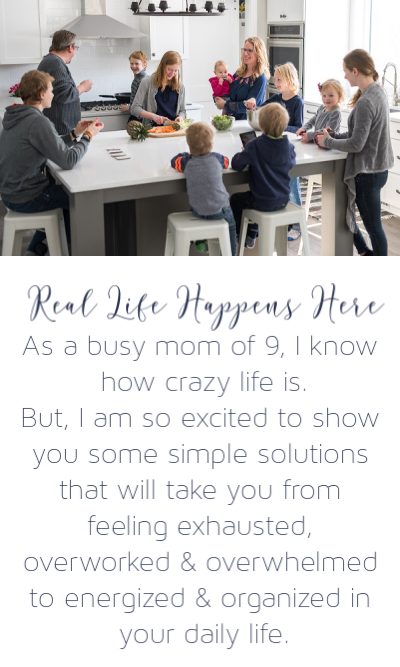 There are so many things we as busy women and moms can feel pressured about to create the perfect holiday that we are left having no fun at all. In fact, we can feel overwhelmed with all kinds of expectations that are impossible to meet. Yet, we try to do them year after year. It’s time to take some of those to-do’s and make them to-don’ts! You heard it here. You can’t be all and do all the time. Therefore, do your best to say yes to less this season. One thing I love to keep in mind is that for every “yes” we give to one thing we are giving a “no” to something else. This concept alone can be life changing in so many things – including the holiday expectations. Whether they are expectations from others or expectations you place on yourself, simply practice the art of saying yes to less this Christmas. When you are saying yes to less, give a short, simple, and gracious no. Avoid feeling like you need to give a longwinded explanation as to why you are saying no. Most likely, that person doesn’t want to hear your longwinded “no” any more than you want to stress about coming up with it. Just a short and sweet, “I’m sorry, I just don’t have any way to make that work right now,” will do. Don’t spent any time worrying about how your no will be received. Your missing this year is to have more Christmas fun with your family. This past year I made the leap and bought an Instant Pot. You can read about it HERE. This is the Instant Pot I have right HERE. We have eaten at least three meals a week from our Instant Pot since I got it because it does such an awesome job of getting things ready in a flash. I am using my Instant Pot in conjunction with MyFreezEasy, and dinners have been a breeze. It was a bit of an investment, but it was an investment in my sanity right now, which is very important! There is no shame in taking shortcuts where you need to. And in some cases, taking shortcuts might be the very best thing you can do. Imagine it’s December 15th, and you’ve just arrived home from your kid’s Christmas program at school. It’s 5:00, which means it’s dinnertime in an hour. Since you didn’t plan ahead of time, you now are faced with what to do with dinner for your family. If taking the shortcut of pulling a freezer meal out of your freezer and sticking it in your Instant Pot keeps you out of the drive thru, it’s a shortcut that has gotten a healthy meal on the table for less money. Another example could be rather than wrapping all your own presents this year you pay a junior high girl in your neighborhood to wrap them for you for $20. In my book, that is a shortcut well taken. This is where I have been focusing this week because I have been doing a really poor job with it, quite frankly. I have been burning the candle at both ends for about the last month, largely because I had my trip to take. The results haven’t been pretty. I have been irritable, and I am convinced that my lack of sleep was the culprit for me being sick for five weeks straight. I have been doing an awesome job at getting enough rest this week, and it has made a huge difference. If you’re like me, resisting the urge to feel guilty about getting some added rest during this time can be tough. But, how can you meet all the extra demands without it? Getting enough rest is essential for busy women and moms during the holidays. Period. So often we keep holiday traditions and we go along with traditions just because “it’s just what we do” even when they prove to be a gigantic pain in our lives. For the sake of your own sanity, examine your holiday traditions and do away with ones that just don’t fit anymore. Most times, we just go through the motions of these Christmas traditions without ever realizing that they are serving no one. I did this with Christmas cards a couple of years ago and I have never looked back. It is one thing that was no longer working for me and added to my stress level. So, out the window it went! Don’t be afraid to find these things in your holiday schedule and kick them to the curb! If getting rid of a few family traditions even for just this year helps you have more fun with your family this year, then so be it. If you’re looking for some ways to take some of the holiday crazy out of the mix this year, read this post HERE on how to keep the real meaning of Christmas in the forefront of your holiday. Similar to getting enough rest is keeping your “me” time in place during this time. It can be tempting to give it up to get just one more holiday related thing done, but just don’t. We all need some time to refuel so we can pour out again. Maybe for you it’s reading a book, going for a walk, or it could even be just a quiet and uninterrupted date night with your spouse. Before you think you can’t possible make date night happen, make sure to read how you can make date night a priority HERE. I think the holidays are a really great time for even adults to act like a kid – in a good way. There is just something so magical about Christmas, and taking the time to slow down and have some good old fashioned fun like you did as a kid might be the best thing you do this year. Head out into the snow and make some snow angels. Drive around and look at Christmas lights. Sing Christmas songs after dinner. Think about what you loved doing at Christmas when you were a kid and do those things. One year we suggested experiences rather than gifts to grandparents, and we did the same. There were few gifts to wrap, and the stress we saved in not having to shop was amazing. And, I found it so much more fun to think about the perfect experience for my kids than buying gifts ever can be. The fun just keeps on coming, too, since many times we as moms are taking part in an experience to some degree as well. The best part just might be that you don’t have any gifts to find room for, organize and put away, or return if they aren’t the right thing. I LOVE having a year filled with experiences rather than stuff. If you’ve never done this, I can’t recommend it enough! If the holidays find you looking and feeling like a hot mess every year, now is the perfect time to do a few simple things so you can actually sit back and enjoy the holidays this year. Since hot mess doesn’t equal fun, remembering these important tips and putting them into place starting right now is key. Ya’ll. One year I am going to keep my family home for the week of Christmas. I don’t know how well it will be received, but my dream is to just spend a quiet holiday week at home with my family and let the rest of the holiday madness melt away. This can be a bold and brave order, especially if you will be letting others down. But, at some point it really is ok to do what you need to do to have some extra Christmas fun with your family. These things are all fairly minimal, but they can pack a big punch when it comes to having some holiday fun. Even if you ruffle some feathers, you will be so thankful you put the focus on having fun with your kids and as a family this year. Looking for more on Christmas planning and fun? Take our Holiday Prep Challenge right HERE – it’s totally free!